Concrete Works – Pacific Paving Ltd.
With 60 years of experience, our team is committed to providing only the finest professional concrete work in the GTA. Pacific Paving provides quality, effective, efficient and affordable concrete work for Industrial, Commercial and/or Residential projects of all types and sizes. We have a dedicated team committed to ensuring that all our customers’ needs are met and that undivided attention is given to every project. From patterned or stamped concrete paving to smaller operations such as repairing damaged concrete curbs and sidewalks, the versatility of our team allows us to tackle virtually any task, from multiple projects covering large areas. Stamped or Pattern Walkways etc. We employ some the best concrete contractors serving Toronto and the GTA. Our Concrete Paving Team has worked together extensively on a multitude of projects. 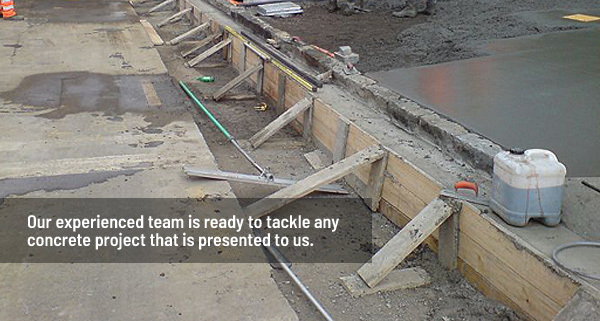 They combine their knowledge and experience into one effective and efficient concrete works team. For over 60 years, our company has been serving Toronto, Mississauga, Brampton, Oakville, Burlington and Newmarket. In order to serve you better, we are constantly striving to improve the quality of our services and technology. Pacific Paving is proud to serve our community!